Finally, a comfortable form of Cold Therapy! 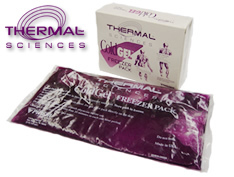 This Reusable, Freezer Gel Pack provides soft, soothing relief and stays pliable when frozen, never losing its gel-like consistency. 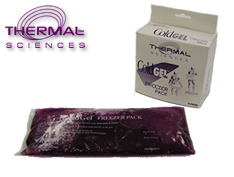 Thermal Sciences™ ColdGel™ provides optimum cold therapy treatment with maximum coverage and freedom of movement. ColdGel™ is a source of fast relief from pain associated with: Sports Injuries, Headaches, Toothaches, and other sore, problem areas. ColdGel™ is completely NON-TOXIC. Wrap Yourself in ColdGel™ and feel the comfort.